Author lzwisePosted on April 29, 2007 July 1, 2013 Categories Cognitive Science, Everything, Taekwon-DoLeave a comment on The more we learn, the less we know? I haven’t written in my taekwon-do blog since our new dojang opened in January – but I have been thinking a lot about the way in which my study of taekwon-do has informed my thinking about cognitive science. Let me be clear about this: there are three elements to my study of taekwon-do which have been pivotal in influencing the way I think. 1) my Instructor, who introduced me to the martial art in an accessible way, showing the theory and practice, the moral culture and application, and most of all, demonstrating through everything he does the ongoing level of passion and commitment required to become a martial artist. 2) the 15 volume encyclopedia of taekwon-do (and its condensed version), written by General Choi, which documents the martial art itself and the structure of the taekwon-do syllabus through which a martial artist can learn his or her art form. 3) the conceptual mapping across perceptual learning, motor learning and meta-cognitive awareness of learning principles through which my Instructor is able to relate theory and practice and through which he gave me sufficient insight and desire to understand the depth and richness of the curriculum developed by General Choi. As I have remarked elsewhere in my taekwon-do blog, the structure of the taekwon-do curriculum, bringing together the martial arts of east with the educational system of the western military (US Military Academy), is a masterpiece of curriculum design and exposition. However, based as it is on curriculum design principles for a military curriculum, there is no specific curriculum framework for children. I have also discussed elsewhere in my blog the special facility my Instructor has in working with young children and older people, two groups who are not the traditional focus for martial arts instruction. The focus I have had in previous posts on martial arts and instructing children have been based around motivational factors in terms of learning most likely because I was involved in educational design of “learning materials”. However now that I am reading Eleanor Gibson (Principles of Perceptual Learning and Development), Williams and Hodges(Skill Acquisition in Sport), Johnson-Frey (Taking Action: Cognitive Neuroscience Perspectives on Intentional Acts) and such things, focusing on perceptual learning and cross-modal sensory-motor integration, I am seeing other aspects of the taekwon-do syllabus that are masterful in terms of design. The constraints-led model asserts that the set of possible movement solutions for a skill to be acquired can be limited by the dimensions of the perceptuo-motor workspace imposed by the coach or training environment. Directed coaching or training environments with limited dimensionality will only support a very narrow search process, whereas unbounded workspaces allow unconstrained search which can be unrewarding, inefficient and potentially unsafe. An important role of the coach or instructor from this perspective is to support the perceptuo-motor search process by manipulating constraints so that exploration occurs within the optimal area of the perceptuo-motor workspace. Interactions between the coach and student are minimised during early stages of learning so that the important dynamics of the movement task are revealed through discovery. “In a soundbite, the key point is: Let the learner begin to write her own story. Direct coach intervention at this stage may well assist in the short-term assembly of coordinative structures as temporary solutions, but the ongoing process of establishing control may be delayed as a result of inappropriate (i.e. textbook and non-individualised) coordinations early on. In fact, the adoption of generalised ‘textbook’ approaches can be likened to the short-term solution of ‘plagiarism in our analogy of writing a story. In other words, the learner may come to rely on these ‘neatly packaged’ temporary solutions for immediate performance effects in specific environments. But the unique relationships between movement subsystems, which influence long-term performance transfer to novel situations, will not be established early in learning” Williams et al 1999, p322. This all starts sounding very like the ideas I was trying express early in my blog in the article on Teaching Kids. The most exciting thing in my taekwon-do life is the fact that USMA (my school) now has its own Headquarters, a full-time dojang in Clayton. It is a fantastic venue, and it was a privilege to help with building it. And with a full-time dojang to enjoy, it might be a while before I find time to write too much more in my blog !! Wow – I think I’m finally beginning to understand a bit about sine wave. Sure, I’ve got the basic bit about down-up-down and I’ve understood that sinewave is part of coordinated action so that within a technique, everything ends at the same time, but I hadn’t really considered the role of sinewave in coordinating with other people or coordinating sequences of movement. When we spar, we are always encouraged to keep moving, to keep bouncing on the balls of our feet, and all good fighters in all forms of fighting keep moving even when they aren’t actually punching or kicking. Maybe it is obvious to everyone else, but I have only just realised that the bouncing is part of sinewave, and the rhythm provides an internal beat for planning and coordinating sequences of movements. More importantly, you can speed up or slow down the beat and still execute the same sequence of movements. When you are watching your opponent, you’re not only watching them with your eyes, but you are entraining the rhythm of your bouncing to the rhythm of their movements (ie you are mirroring their timing so that you know when they will be able to execute a technique). You can then set an appropriate phase lag between your sinewave and theirs so as to time your own techniques for when your opponent is unable to respond. So when are they unable to respond? If you know by understanding your opponent’s rhythm when they are capable of executing a technique, whether or not they do, you can adjust your sinewave (bouncing) so that your techniques will only show themselves when your opponent is already committed to whatever they were going to execute (they have already selected a ballistic movement to a specific target) or they are not yet ready to attack (they have missed that wave of their own sinewave). You will have so much more time in “planning” because you have already encoded the relative timing information between their actions and yours into your own sinewave or bouncing rhythm. So – the bit that started to fall into place was that bouncing (keeping moving) in sparring is not just random moving, and not just keeping a rhythm for yourself, but it is a part of a “conversation” with your opponent to keep the appropriate timing and phase relationship between your movements and theirs, so that you always have the advantage. If you are sparring with someone who understands this conversation, the trick is to be able to change the tempo to keep the advantage. The reason that skipping is the preferred endurance training for fighters is also an obvious correlate of sinewave. The circular motion (sine wave is a circular function in mathematical terms) of the rope powered by your arms ensures that you have to entrain your arm movements to you leg movements and you have to jump. The cyclical visual cues of the rope are also being entrained so that you can start to associate visual information with motor information. The “conversational” aspect of skipping – the entrainment to the visual cue – can be seen when someone else turns the rope. If you watch kids run in to skip in an already turning skipping rope, they move their arms or bodies up and down for a few cycles to get the rhythm of the motion. There is an easy side and a hard side to run into because on one side, there is room for error (the rope is coming down so you can duck) whereas on the other side, the rope is going up so there is no room for error. Hmmm – I’m getting to wonder whether I should be writing this in my taekwon-do blog or my work-related edublog but since the thought processes and content have come directly from interactions with my taekwon-do Instructor and fellow students, it really should go here. Because my background is in academia, particularly in cognitive neuroscience and, for want of a better term, “educational design / pedagogy”, I have been encouraging my Instructor to provide more written materials for students to “study” at home to reinforce what they learn in class. Being an older student and academic by nature, I needed to see most things written down in order to understand them and practice them, and I found many interesting resources on the web. Fairly early on, I bought the Condensed Encyclopedia, and it was an excellent investment. Also, being a parent of a child learning taekwon-do, I wanted to be able to “help” my child practice and study correctly, on the assumption that my child would not be concentrating and therefore would miss half of what was said in class, and would practise the wrong things if he practised at all. We have a pretty clearly set out grading manual, which explains what we need to know for each belt level, but it doesn’t have the intimate details of each pattern, nor does it have details on each technique. For that level of detail, we are encouraged to buy the Encyclopedia. When I think back to how I dealt with the lack of detailed written information that I felt I needed to help my son get the best out of taekwon-do classes, I had two approaches. 1) I attended the classes too so I could listen and learn and know what he had to practise. 2) Before I bought the encyclopedia, I put together my own set of notes from the web to support what I was learning in class, and to break down the higher level things into the level of detail I thought I needed. 1) The parents of some of the children want to have notes from the classes so they can help their kids practise at home. This is a good motive. 2) They want their kids to practise because they see their kids “falling behind” their classmates. This is where it becomes interesting … the kids don’t like other kids getting better than them, especially when some of the other kids are physically less naturally talented. Parents also don’t want their kid to “fall behind” even though they want them to learn “at their own pace”. Everyone wants to be the best at everything (good – although maybe I mean “do their best” rather than “be the best” …) without necessarily wanting to do the work that goes with it (bad). 3) If the kids do extra practice at home, they will perform better in class and they will “do better” and move up the line and then feel better about themselves. We probably all agree they will perform their movements better, but they will only feel better about themselves if they care about their taekwon-do movements (good) or if position in the line is important to them (bad if they don’t care about taekwon-do per se). But when they are not ready to do it themselves, we want to take the short-cuts on their behalf and do it for them so they never have to feel the frustration of not knowing something when some of their peers do know it. We are very concerned that if our kids “fall behind” everyone else, that they will feel bad and not want to keep going. And undoubtedly, our kids are perfectly aware of our anxiety and disappointment on their behalf and it is actually us as parents that reinforce the idea that, if “their own pace” is a bit slower than that of their age-group peers in something, they are duds. If we have notes on what the kids need to learn, there is another risk that I am only just understanding in this different domain although it is one of my major hobby horses in academia. When we list the things for assessment, or some specific things people “need to know”, they become focussed on learning those things, rather than seeing them as representative of the type of knowledge expected of someone at a particular level in a discipline. And we then fixate on specific things that “prove” our achievement rather than on being rounded martial artists. And sometimes we focus on special tricks that will let us perform better on specific tasks but will not improve us in the discipline itself. And from outside of the discipline, we might see better ways of teaching the things that will be assessed to improve test performance, without understanding the bigger picture of how to learn the whole martial art. We become instant experts in how to do something despite only have the limited view of the children we know trying to learn something we don’t know ourselves. 1) I started taekwon-do to help my son make the most of it, and to make sure it was the sort of martial arts environment I was happy for him to be in. 2) I immersed myself in taekwon-do because after listening to my Instructor and reading the web and the Encyclopedia, I was hooked and *I* wanted to learn it myself. When I practised (myself because I wanted to practise), quite often my son would practise too. When I left taekwon-do related material lying around on the coffee table, my son would read it and study it. Yet if I ever asked him to practise or to study something for a grading, he would point-blank refuse – kids don’t like being told to do stuff especially if thtey are told it is “good for them”. But they are naturally curious and competitive. 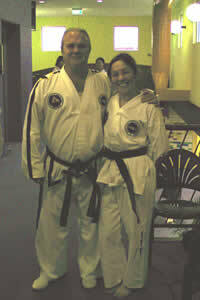 3) I advanced more quickly through the belts than my son because I listened to the Instructor and I practised a lot. My son would have stopped lessons mid way through (around blue belt) if I had let him – our deal was he would do it for three years if he started it at all, and I held him to that. Towards the end of the three years, he was starting to enjoy it again for himself, not for me. His practice and study are now unrelated to what I do, except that he knows that if he tries, he can do anything that I can do better than I can do it. But I’ve done some things that he is yet to do … which bugs him, in a good way 🙂 The presence of a free standing punching bag means that he practises as often as he wants and the encyclopedia and internet means he can access as much info as he requires to understand what he is doing. 4) We can train together not because I am a parent who can make him study and make him want to do better and be proud of himself, but because I am a fellow taekwon-do student with him. I have also demonstrated (not deliberately !!) the various phases one goes through in learning something, especially the inevitable frustration with the Instructor. At some point where you can almost do something, but not quite, you often feel like the Instructor is just not telling you something for their own amusement … and then when finally everything clicks into place, you realise they had told you all you needed and you just weren’t doing it properly … d’oh!!! It is very important for them to see the reaction (and it’s important that the reaction eventually be constructive !!) If they see their parent working hard enough to master something difficult (at least to a certain degree) and then feel a sense of pride in their parent because they know how hard their parents worked to learn something … it’s a great lesson all round. As parents, we want to ensure that our kids have an opportunity to try everything. We want them to be good at everything. We want them to learn as much as possible and so long as they are happy, so are we. But mastering new things involves an inevitable phase of frustration when new ideas or new movements are still taking shape. I contend that that phase has to happen for true mastery of something difficult. Being tired and frustrated and not wanting to continue is an important phase of learning and when the new thing is learnt, there is an exhilaration of achievement that matches the level of effort that went into that phase. So if you don’t struggle to learn something, you don’t appreciate achievement in that domain in the same way. And you don’t “own” the knowledge. And if you never learn how to deal with the frustration because you never have to take responsibility for it and someone always steps in and gets you over it, you will not be well-equipped to cope with adult life. So this is a critical part of the learning process, and a critical part of the mental discipline side of a martial art. Does that mean there is no place for written teaching material in teaching taekwon-do? I don’t think so. I think that all it means is that I’ve begun to understand the real problem with written material aimed at allowing the parents to “help” their kids. Parents can help their kids best by watching them in the classes and listening to what their kids have been told and shown. If they don’t have time for that, they can help their kids research what they need to know, or have their kids explain what they remember. The kids need to know that they are learning things that their parents *don’t* know (how cool is that for some kids?! ), and parents need to remember that the act of explaining things is an act of building that knowledge into their own picture of the world. This has been written in response to one of the teenage students wanting my help to put together some stuff for the parents so they can help the younger kids practise. I’ve realised that the major learning here is for the student putting together the material (learning by having to think about how to teach) rather than in producing materials for the parents themselves. And at some level it is not helpful to the kids to have their parents helping them – taekwon-do expertise does not derive from age, but from belt-level – ie from the amount of training and learning in taekwon-do itself. Our Instructor is trying to instil into the kids the ability to think for themselves, to ask questions, to find answers within themselves as well as around them and to be self-motivated in what they do. It is one of those wonderful paradoxes of parenting and teaching that you can’t *teach* self-motivation. You can only encourage it, and I contend that you can only encourage it by being passionate about what you do, and inspiring others by your passion. I have had the privilege to have been inspired by an excellent and passionate Instructor who understands the essence of teaching and is a master of what he teaches at a time when I am trying to understand in an academic framework what is special about teaching and learning and what constitutes “best practice” in that area. The research suggests quality in teaching and learning is about the teacher-student interaction and communication rather than about disembodied content but of course “quality audits” focus on what is easily measured and disembodied content (the “curriculum”) is easy to examine “objectively”. For me, the introspection as a student and trainee-teacher in the context of an expert Instructor teaching all ages and abilities has been invaluable. I am very proud of the fact that on June 19, 2005, approximately 3 years after beginning my journey in taekwon-do, I was awarded my 1st Dan Black Belt by Sabum Spiro Cariotis. I have trained at least 3 times a week for all but the first month or so of my training, and I trained almost daily in the 6 months leading up to my grading so it was a big commitment in terms of time and energy. The blackbelt was certainly a motivating goal to keep training, but it has not been the endpoint in itself – I have continued to train 3 times a week since my grading and am still as passionate and as enthusiastic about taekwon-do as when I started. I suspect that I haven’t updated my blog until now because I needed the evidence (for myself and maybe for others) that it would indeed be the case that I would keep training with a passion. My blackbelt as an achievement in isolation is actually meaningless since in physical terms I am only just beginning to feel comfortable with moving and thinking as a “martial artist”. I am fully aware that to think in terms of expertise takes at least 10 years, so I am still in the early years of that journey. What I am convinced of is that it is possible to learn new physical pursuits at any age in life so long as you are prepared to put in the work and I still have a lot of work to do !! I really enjoyed the grading itself – I was surprised at how smoothly the day went for me. My patterns were quite passable and although I was initially intimidated by the idea of grading alongside two girls who perform patterns with exquisite grace and skill, on the day I felt reasonably comfortable and confident and on reviewing the video afterwards, I was pleasantly surprised with the outcome. I also surprised myself with how comfortable I felt with fundamental movements, step sparring and self defence under the pressure of grading. Sparring was physically taxing but I was pretty confident of my fitness level and my ability to survive if not to star. The most challenging part of the grading for me was always going to be the board-breaks – I have trained for them since whitebelt level, but I am small and technique and timing are not my strong points so I have always been concerned about what might happen on the day itself. You can’t fake board breaks. As it turned out, I was very focussed and completed all the breaks asked of me. I was pretty stoked by the fact that I did a flying sidekick over 4 people (it was originally going to be over 2 people given my size and age :-)) – unfortunately my designated cameraman was so enthralled in watching us that he forgot to turn on the camera to preserve my effort for prosterity … so there is no photographic evidence of my feat !! So I am now a black belt in taekwon-do and I’m proud of it, but it is only the first step in a longer journey to be comfortable calling myself a martial artist. – this is a link to my blackbelt thesis on the structured curriculum of taekwon-do and why it particularly appeals to me. I have been thinking about a range of relationships between taekwon-do and my own discipline area of psychology. Today’s thoughts are built around the idea that fundamental movements are the words of taekwon-do, sequences of fundamental movements form phrases and sentences (e.g step sparring, where there are small structured conversations through to free sparring where there is an ongoing dialogue) and patterns are exemplar formal writing – the sonnets of taekwon-do, where choice of movements, the way they are put together, the underlying symbolic structure, the philosophical tone, the grace and coreography are all part of a carefully crafted and deeply meaningful story. In considering fundamental movements as words, it occurs to me that the movements within fundamental movements are like phonemes and syllables – so that the way we turn our foot at the execution of a turning kick or side kick, or the way that we move our hips through various hand techniques are like pronunciation of individual syllables or sounds. If I lisp, it will affect the way I say certain words, how I put together certain sentences, and whether or not I am able to speak in a way that is correct or easily understood. If I don’t turn my foot properly on executing certain taekwon-do techniques, it will permeate through all my taekwon-do movements. Another parallel with language relates to the concpet of universal generative grammar. Generative grammar, abstract rules – can say an infinite variety of things that are understandable by other native speakers who have the same ruleset. In understanding foreign languages – the difficult part is to identify word boundaries. When you speak word-by-word, it is very stilted and often doesn’t make sense. When you speak fluently, the words flow together so that the boundaries between words are indistinct. If you look at the sound spectrum of spoken speech it is still the greatest challenge in speech recognition software to recognise word boundaries. Speaking to a speech recognition system requires you to calibrate the system very very closely to your own speech and to use a very closed vocabulary. One thing that has always intrigued me is that in a martial art in which “discipline” is paramount, Sabum Cariotis does not enforce discipline on young kids in the straightforward way that I would approach it. I tend to say “Do this!” and then stay and wait until it is done. I am reasonably good at this form of “crowd control” and have assumed that crowd control is a necessary pre-cursor to “learning readiness”. In other words, I have implicitly been operating from the assumption that before the kids can learn anything, they need to be quiet and listening but I haven’t considered whether it matters at all how they got to be quiet and that once they are quiet, how you actually get them to listen actively rather than passively to what you are saying. Although in my professional role as an educator, I spend a lot of time considering teaching and learning strategies for adults and I have always argued that understanding how to talk to kids is one of the best preparations for teaching adults, I actually haven’t spent much time relating what it is that kids are “listening to” back to the teaching situation – I teach in the tertiary sector, I teach concepts, and I am very much a person of words, so I automatically think of listening as being focussing on what I am saying despite being aware personally and professionally that “active listening” involves a whole lot more than that. I am also aware that younger kids in particular will naturally understand the inflections in speech which carry the emotional content of what is being said irrespective of whether they understand the semantic content (ie the meaning of the words). They read “body language” in its natural form in a way that many adults (sadly) have been taught to filter out. So although I might think that I succeeded a bit in teaching kids by ensuring that they are under control and doing as I say, what I see Sabum Cariotis doing is capturing his students from the inside out. He captures their attention and motivation from within themselves in contrast to my approach of trapping them in a corner and forcing my will onto them. It occurs to me that the essential difference will be in terms of “ownership” of what the students learning – when I force my will on someone in a teaching situation, they might “learn the basics” much more quickly because of my enforced discipline than if I try to achieve self-motivation for learning first, but I have probably stifled their ownership of learning, their willingness to seek out knowledge on their own and, in the longer term, their creativity. This loss of creativity is hugely important and is something that can’t easily be rectified. When Sabum Cariotis talks to children (and adults) about taekwon-do, he tells stories and these stories are constructed at multiple levels. He tries to place the taekwon-do story into a context that matches the level at which the students can comprehend. Within a multi-age class, each story has strands that are accessible to each different level and many stories are told simultaneously in choice of words, in emotional tone, in choice of analogy and metaphor, in physical demonstration. Very few instructors have the depth of knowledge combined with passion for the content combined with respect for their students to engage with people in this way. 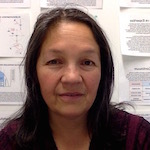 I see many parallels in what Sabum Cariotis does and the way that a passionate academic teaches in their discipline area. What I haven’t really thought through before is the skill involved in inspiring passionate interest in young children for something (eg biology or history or even cooking and gardening) … it is easy to get kids to do activities relating to these things copy-cat style, and it is even straightforward to get them to be excited about bringing their work to you for your praise. But it is a wonderful and entirely different thing to inspire a passion that can feed their creative spirit throughout their lives so that they do things for themselves. A very common theme for people who excel in a particular area is that a single great teacher stands out as their inspiration. This is unlikely to be the teacher that sat everyone in straight rows and made them follow the lesson plan to the nth degree!! It is far more likely to be the unconventional teacher who reached out to them in their world and built their self-belief and creativity while sharing their own passion for learning in their discipline. The thing that is emerging for me in writing this is not directly related to taekwon-do, but relates more to the tertiary sector that I work in. In the mid eighties, before the huge and rapid expansion of the university sector, it was considered quite inappropriate to lecture even at first year level in a discipline area in which you were not an active researcher – if a topic was outside your core area of expertise, who were you to think that you could teach in it?! But as student numbers and teaching loads increased (and $$$ became critical), it sounded a bit precious to say you needed to be an expert to teach first year. These days it is unlikely that even at third year level it would be considered necessary to be an active researcher in an area to lecture in it. But what is lost is the depth of knowledge, the multilayered “stories”, and the passion that experts have for their domain. The subtlety of how things are put together to lead into a capacity for creativity in an area is lost if you don’t have the depth of knowledge to understand how an area is structured and how it relates to other areas and other concepts. The subtlety of good teaching is replaced by “process” around things like learning objectives, lesson plans and a need to be very explicit about assessment. With structured lesson plans, people who don’t know the content area think they can teach, and worse still, that they can judge quality of expert teaching even though they are not in a position to judge the actual content … this approach is very misguided and depressing and spiritless, and probably says a lot about our current social, cultural and educational values and the lack of passion and creativity in our lives – and this uplifting thought is probably a good place to stop writing for the moment … it can only go downhill from here !!! Although my blog has been quiet for the past year or so, I’ve actually been thinking a lot about taekwon-do as a martial art and how it relates to exercise sciences and to my cognitive neuroscience discipline area – perhaps it’s time to start articulating these ideas a bit more formally, and blogging seems as good a way to start as any other … and warmups seems like a good topic to begin with. We have a number of different black belts at our club who from time to time take the warmup session of our classes. It is always interesting to see the variety of approaches, and the different ideas that are expressed through these warmups. Most people work to their strengths, so the aerobically fit people tend to emphasise aerobic aspects of warming up, the flexible people emphasise stretching, the exercise scientists and physiotherapists talk at length about the biomechanics of each aspect of warmup, the powerful people emphasise different ways of building sets of muscles – it is all informative and it allows us to see the full range of what it takes to develop our bodies to their full potential while at the same time learning a bit more about the people we train with. What also tends to happen is that each class member enjoys different aspects of a warmup, and through talking about these differences, a range of motivation and expectations with respect to taekwon-do are revealed. In considering a range of opinions and approaches, I found my own conceptual understanding of warming up and of “fitness” in general has been challenged and extended, and I have developed a renewed respect for the depth and layers within taekwon-do as a martial art. Three things that stand out to me are the expectation from taekwon-do students 1) that taekwon-do training will build their aerobic endurance and their flexibility (true), 2) that this can happen through their twice weekly 90 min taekwondo classes (true but only to a fairly limited extent), and 3) that the purpose of the warmup is to build aerobic fitness and flexibility (not true). Significant aerobic endurance can only be built by performing aerobic activity for a reasonable duration *every day* – for example by walking, running, swimming or cycling for at least 30 mins most days at moderate intensity with at least one day a week devoted to a longer session at lower intensity. The resulting aerobic endurance will depend on the intensity and frequency of training. This is not going to happen in two 90 min sessions per week, and certainly not via the 15 – 30 mins of aerobic warmup. It does not make any sense to expect that it is possible. In order to be aerobically fit for taekwon-do (eg to spar in tournaments), an aerobic training program (eg running including sprint work and hills) outside of classes is required. Improved flexibility involves lengthening muscle fibres, and ensuring that muscle pairs are lengthened and strengthened in a coordinated way. For example, if you have very strong thigh muscles (quads) and they can contract powerfully to lift your leg, you will need to make sure that your hamstrings are sufficiently flexible and strong to cope with being stretched when the quads and other muscles contract during for example a front kick. If the hamstring is not strong, it can easily be torn by the more powerful antagonist muscles during a kick. When the hamstring has been appropriately conditioned, the next muscle to feel the strain is the calf muscle – hamstring injuries are probably more common than calf injuries because if both muscles are equally unconditioned, the hamstring will stretch and tear first, thereby protecting the weakness of the calf from being demonstrated. In order to lengthen your muscles, you need to warm them and stretch them slowly beyond their current extent. There are lots of ways to do this, but the result of lengthening a muscle is to render it weaker for at least a couple of hours afterwards. So generally, you would *not* want to do a serious stretching routine for increasing flexibility before or at the beginning of your taekwon-do training session because it would be counter-productive. The stretching that is done during a taekwon-do warmup is designed to warm your muscles and take your joints and muscles through their full current range of motion so that the work that you do during training is at your current maximum level. For example if you warm up properly so that your side kicks are being performed at the maximum height you can currently attain, you will build your strength at that level and although this will undoubtedly allow you to gradually increase your range over a period of training, it will not improve your flexibility dramatically or quickly. So what is a warmup all about, and how does this relate to fitness? The first and most important point is that the concepts of “warmup” and “fitness” are meaningless without a context. Warmup for what? Fitness for what? The warmup for an activity depends entirely on the activity and the context in which it is taking place. A warmup for cycling is different from a warmup for swimming which is in turn different from a warmup for sparring. A “warmup” in 35 deg heat is different from a warmup in 12 deg and serves a completely different purpose. In 35 deg heat, you want to ensure that your body temperature control systems are activated properly and your fluid regulation system is operating well rather than that your muscles have reached an appropriate warmth (which will be taken care of by the ambient temperature). In the cold, there will be more emphasis on ensuring adequate blood flow to peripheral muscles and getting the heart rate into an appropriate zone. In both situations, you want to ensure that the joints and muscles you will be using are comfortably moving through their full range of motion at their correct operating temperature. In the taekwondo context, a warmup for patterns will be different from a warmup for sparring and different again from a warmup for jumping techniques because they use different muscles. However there will be some aspects of warming up that are consistent. We will almost always be kicking, so we will almost always want to do some front snap kicks and front rising kicks to stretch our leg muscles. We will also generally want to do side kicks and turning kicks maybe with speed, maybe with power, to get our lower backs and hips operating. One specifically taekwon-do exercise that we do frequently involves squatting with one leg extended to the side with the toes pointing up and the foot of the other leg flat to the floor. This exercise will stretch the hamstring of the extended leg so long as flexibility of the supporting leg is sufficient to allow you to go low enough. Many people cannot squat low with their supporting foot flat on the floor and so they lift their heel to get much lower and also use their hands to support their weight. We are told to keep our heels flat to the floor and not to use our hands when swapping from side to side but most of us ignore these instructions in favour of getting much lower. In a year of doing this, I did not improve my strength or flexibility in this exercise. However since I have chosen to try to do it properly and to focus on keeping my body upright, I have actually improved my strength and power in kicking dramatically, although the height of my kicks has not increased much. What I have actually realised is that most people do not have well-balanced muscles in their legs, thighs and groin area. Some muscles are strong and flexible, some are strong, some are flexible, but to do the exercise properly (and to kick properly) it is necessary to have balanced strength and conditioning across all the muscles involved. So by maintaining proper form and then “bouncing” (a controlled small movement not an uncontrolled bounce) at the boundaries of movement, we can strengthen the muscles in a coordinated way and move through the whole range of motion using the balanced power of the whole muscle set. This is much more valuable than extending one of the muscles (in an unbalanced way) while supporting our weight in the wrong position with our hands. It is very useful to *feel* the limiting factor in each exercise and to work on that, so that we focus on our weakness rather than working to our strengths. For me, the flexibility of my calf muscle to allow my foot flat to the ground and the strength of the muscles around my supporting knee are the first limiting factor for this exercise, not anything to do with my hamstring of the extended leg. When I first started taekwon-do and the instructor said to “bounce”, I thought I knew better than to do this old-fashioned thing which tears musles rather than making them more flexible, but over a period of time and after listening to the instructions more carefully, I am aware that we are not bouncing to increase flexibility (an outdated and damaging approach because it causes micro-tearing which actually stiffens and shortens the muscles), but are moving in short controlled bounces to increase the strength of the muscle at its full extension, which is exactly where the full strength is needed in a martial art. When we kick, we want to contract our muscles in perfect timing at the full extent of our kick for maximal power unlike in most sports where the maximum power is in the middle of the movement. Basically, a superficial biomechanical context-free analysis of the exercise might lead people to do it differently and in a way that does absolutely nothing to improve kicking, whereas a deeper analysis in context reveals the exercise as a perfect warmup and conditioning exercise for taekwon-do. Furthermore, once you go context-free and start analysing exercises purely for their biomechanical outcomes, you start needing to know details of agonist and antagonist muscles and working to balance work with one muscle group against work with its opposite … to ensure a balanced approach requires quite deep level knowledge of muscle groups. However, if you remain within a context such as taekwon-do, and you do each movement slowly and quickly and in the variety of ways that occur in fundamental movements, patterns and step sparring, you will build balance across all the relevant muscle groups without ever having to know their names or think about anything other than excellent taekwon-do technique. In one fell swoop, you replace a nit-picking detailed muscle analysis and spiritless list of “do this 15 times followed by that 20 times, then drink this many mililitres of this and eat 25 gms of that” with a tapestry of techniques layered together with a depth and intricacy so that every time you look, you can see different aspects of a picture with new horizons and possibilities. Just as the concept of warming up relates specifically to what it is that you are warming up for, the concept of fitness itself is not context free. I was unaware that definitions of fitness in exercise physiology incorporate the not only the physical aerobic, power and flexibility notions one would expect, but also incorporate skill level, such that technical and cognitive skill are important aspects of fitness and fitness can only be determined with a purpose in mind. The technical aspect of fitness in taekwon-do deserves some consideration and is possibly worthy of an article of its own since I haven’t really thought it through completely. 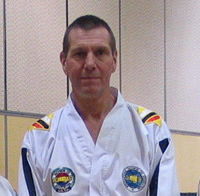 When I started taekwon-do, although I was about 10 kg overweight, I was pretty “fit”, riding around 150 – 250 km per week and playing indoor soccer. However I found the L-stance quite uncomfortable because it put my rear leg in a position it was not used to, with the outside of my ankle feeling sore and some little muscles on the outside of my knee and my inner thigh feeling quite stretched too. I also found it hard to move backward and forward maintaining good balance and good stances because my inner thigh muscles and various other leg muscles were not strong enough to support me strongly through the whole transition from one stance to another. So my technique was poor because the appropriate muscles to support good technique were not developed. So my fitness for taekwon-do was significantly lower than for cycling. Also once I have a deeper understanding of taekwon-do movements and their purpose, I use less extraneous energy doing things that are not relevant to taekwon-do. For example, overly extragavent movements are wasteful of energy and this bad technique will render me less “fit” than if I conserve my energy appropriately. Poor breath control will render my techniques less powerful so I will need to compensate by expending more energy and I will be less fit on two counts. The many layers of taekwon-do come to mind when we consider that part of the discipline involved in training is that until we are told to relax, we hold the last position we were asked to take up. This is good mental discipline, but it is also an important part of strength training and of technical training – if we hold a good L-stance with guarding block (or sitting stance, or walking stance or whatever) for an extended period of time while the instructor is talking, we are training our muscles isometrically in a specifically taekwon-do stance, and we are developing “muscle memory” for that position and ensuring that it feels comfortable and natural. If we stand tall and with good posture in our stances and during our “relaxed” time in taekwon-do, we are developing our core body muscles through taekwon-do – it makes more sense to do this via taekwon-do movements than to bring pilates or context-free VicFit style training into our training since we are training for our own martial art, not for something else. Last Sunday we had our first Training Day for the year. The focus for the day was on umpiring and refereeing for tournaments. There were more than 30 students from our school, ranging in age from primary school kids to adults. We started with Chon-Ji, looking at how we perform each movement technically, and how our technical execution fits together within the pattern. We then watched individuals and teams performing a range of Gup patterns and discussed how we would score each performance based on the appropriate criteria for Technique, Power, Breath Control, Balance and Rhythm. We discussed the degree to which these things interact with each other (underpinning the importance of sine wave), and then all the students divided into teams to coreograph a team pattern to introduce the concept of coordination between the team members as yet another aspect to performance and to judging. It is so important to see the things we do from a range of perspectives so that we understand the bigger picture and can see both where we came from and where we have to go. After lunch, we spent an hour on Power Breaking and Special Techniques, with detailed breakdown of how to perform each technique under tournament conditions. Then we learnt how to be corner judges and referees while we practiced our sparring. It was a really good learning exercise to be sparring with a view to scoring points and then immediately sitting as a corner judge and trying to award points fairly – the change in perspective reinforced lessons in both spheres and made the later part of the day pass surprisingly quickly. The experience we gained during the Training Day will be reinforced in upcoming In-House tournaments, so that we will have plenty of confident and qualified referees and judges into the future and it will allow some of the adult club members an opportunity to participate actively in tournaments without having to compete themselves. It’s a long time since I wrote in my taekwon-do blog. I certainly haven’t quit taekwon-do or lost any enthusiasm for it. In fact my last 6 months has been totally immersed in taekwon-do related activity. I have been more involved in the administration of the school, especially related to school programs, and I have also spent quite a bit of time reading in the areas of psychobiology and cognitive neuroscience with a view to how they relate to the practice of taekwon-do. I hope to write some entries on this in the future. I have also been re-visiting all that I’ve learnt over the past 2.5 years in preparation for my black-belt grading. Basically I see the black-belt grading as consolidating all the information from gup level so that it is a firm foundation for the real journey in taekwon-do which takes place through the Dans. I have also been working with my training partner, Fiona, trying to “feel” the movements in 1-step sparring and self defence. I have noticed that the male students spend a lot of time “playing” with movements, testing out different ideas of how to move, and always going beyond whatever movements are being taught as a natural way of expressing themselves physically. The female students have more of a tendency to stick to what is being taught, and to try each movement tentatively rather than vigorously thereby losing a lot in terms of being realistic. We also tend to freeze under pressure, something that will need to be overcome before our grading ! All in all, I feel like I’m at a stage of growing into my taekwon-do, but I have less to say about it because the more I know, the less qualified I feel to write about it. When I started taekwon-do, I went to classes, read widely on the web and from a number of books, and everything seemed pretty similar in terms of content although it may have been expressed differently here and there. However now I can see that so much of what I am learning in my classes goes beyond anything I have read on the web and comes directly from my own Instructor from his personal depth of knowledge of martial arts and his personal study of Taekwon-Do as created by General Choi. It is a privilege to learn from an instructor who himself is always ready to continue studying and learning from other masters of the art. We are having our first interclub tournament since I’ve been with USMA. We are competing against ITDF at Ashburton. The emphasis at training since the grading has been on sparring and fitness, and it has really improved our speed and concentration. Well my black tip grading was a long time ago – September 11th (hard to forget the date) and three days after my daughter left for a five month student exchange in France. I’d have to say that “life” got in the way of my preparation for this grading (as it tends to do every now and then) and although I am now a black tip, I would have liked to have performed a lot better on the day. I managed to execute all my patterns without any glaring errors, but I’m not sure that sinewave or grace of movement were great features of my performance. My self defence was not exactly a dynamic exhibition of realistic movements either, and would have been somewhat disheartening for Sabum Spiro since he has spent a lot of time working with us on self-defence moves and they are one of his strengths. I will need to work on these extensively before I grade for Black Belt (hopefully next July). My free sparring has improved considerably (which is at least one step in the right direction :-)) but all in all, my performance on the grading day itself was below par for what I would like to think I’m capable of. Anyhow, since September (and while my non-taekwon-do daughter is away) I have been training fairly hard, and I am even contemplating learning how to jump although that might end up proving to be a bit ambitious … still it will be nice to go to a grading in December without the pressure of grading myself to watch the people I train with performing their stuff. At USMA we were privileged to have Master Paul Cutler give a 2 day seminar. Unfortunately, due to work commitments (a conference in Queensland), I was only able to attend the first day, but one day was probably enough for me to try to absorb anyway. Below are my notes from the day and apologies for any misrepresentation or misunderstanding of what Master Culter had to say to us. Master Cutler began by telling us a little bit about himself, and the fact that he has trained in taekwondo for over 30 years but has only ever had one instructor, Grand Master Rhee Ki Ha. Since Grand Master Rhee was the right hand man of General Choi, Master Cutler’s training has only been one step away from the founder of taekwondo right from the beginning. He also made the point that all the writings on taekwondo in English are translations from Korean, with inevitable confusions arising over language. Now that General Choi is no longer with us and cannot arbitrate on issues where clarification and guidance are required, it is left to those close to General Choi to pass on as much as they can of their understanding of taekwondo – and the further away people are from the source, the more likelihood of confusion in interpretation. The other point he made about taekwondo and us as martial artists is that different people will apply taekwondo differently depending on their way of moving, their way of thinking and their body shape and rhythms. No one way is the only correct way, and taekwondo is our own personal embodiment of the principles articulated by General Choi. During Day 1 of the seminar, we covered the sorts of things that would happen in a normal class – warm up, stretching, fundamental movements and patterns – and Master Cutler observed our technique and provided insight and specific exercises to address some issues with our performance. I’m not sure how much of what he said to us was new to us, but a different perspective and a different way of explaining things is always helpful. My notes below are my interpretation of what he said and other people will certainly have picked up different emphases and different key pointers depending on their own way of thinking and moving. Our stretching and warm-up needs to target our hips and groin areas as clearly the lack of mobility and flexibility in this region is restricting many of us in technical execution. We are also lacking strengh in core lower abdominal muscles which are the key muscles in driving taekwondo movements. We also need to focus on staying on the balls of our feet rather than stomping around on our heels. Although many of us are trying to use sine wave effectively, our timing and coordination between sine wave movement, technique execution and breathing is not very effective. 3. Check stances and ensure they are correct when practising patterns and techniques otherwise you will not be performing them correctly – need to obsess about this in training so that it will be natural if it is ever needed. An interesting theoretical point that was new to me was that jumping kicks are completed as the foot lands (as in the back fist in Yul Gok and the X-block in Toi Gye) so that the jump (or leap) brings you to your target more quickly over a greater distance, whereas techniques which are completed in the air are called flying techniques. connecting motion so far as I understand it, is like a continuous motion but using different tools (eg circular block / punch in Yul Gok) … but I must say I don’t really get this properly. A particularly insightful exercise from my perspective was the one where we were asked to describe certain perceptual experiences in words (eg describe what blue is like to someone who can’t see …) – his point was that you need to “feel movements” to truly understand what they are. So we had difficulty seeing the difference in his stepping in walking stance when he pushed off his rear foot rather than driving from his leading leg, until we felt the difference ourselves. This driving with the leading leg rather than pushing off the back leg is important for balance. The other important thing was to ensure that we were on the balls of our feet when moving, and especially when turning. Many of us were beginning our turn (doing the first 90%) on the balls of our feet, but then finishing our swivel on our heels – we need to remain on the balls of our feet for the whole turn. The specific exercises for basic kicking put together the basic ideas described earlier. and of course most of us could not hold our leg in the extended position above waist height without turning our back foot – which makes it some other kick but not a front snap kick … I’m assuming the limiting factor is the mismatch between the flexibility / strength of the opposing muscles in the thigh – our hamstrings generally will need to be more flexible, but our quads require holding strength while maximally contracted and are working against gravity (something about eccentric contraction and some exercise physiology of recent times but currently escapes me) … I’m not sure what exercises will assist with this specifically. 2. Extend leg to 3/4 extension and bring fists to crossed position ready for block/punch BUT don’t turn leading foot !!! (Step 2 is the upward phase of sine wave, and step 3 is the downward phase of sine wave). Note that most of us are turning our leading foot in step 2, thereby robbing step 3 of its explosive power from the hips. Turning kicks and back kicks also need hip rotation, and we worked on executing them from a position where the opposite knee was raised which seems to force the hip rotation better and also assists with speed. Anyhow, that was probably the major points for me from the seminar, and I will be keen to hear what was covered in Day 2. The only other thing that stood out to me from the seminar relates to the fact that I went straight from it to a conference where some of the focus was on education and training. I work in the area of educational design of learning materials for higher education, and it is remarkable to me that nearly all of what Master Cutler was saying about learning and teaching and how to apply theoretical knowledge in the real world is pretty much a restatement of high-faluting pedagogical theory. His ideas about setting goals and being clear on learning objectives are not revolutionary but were concisely articulated in language appropriate to the audience and his teaching methodology was a practical implementation of pedagogy based on contextual learning and situated cognition. Well it’s a few weeks ago now, but I’ve actually made it to red belt … certainly pleasing, but also a bit worrying in that I don’t yet feel like a senior belt in terms of my ability to execute different techniques. Hopefully that will come over the next few months. Grading Day began with Black Belt gradings for four adults who I’ve been training with since I began taekwondo – I must say it is very rewarding / inspiring to watch how people have grown and improved over the two years I’ve been learning, and it was great to see them grade successfully. I used my new camera (Canon G5) for the first time, and was very pleased with the resultant pictures from the grading. Having spent the morning focussed on supporting and photographing the Black Belts (and acting as sparring fodder …), it was a bit of a shift in mindset to prepare myself mentally for my own grading. Not only did I need to do a mental shift on the day, I have also been spending less time training recently due to work and family commitments so although I knew what I needed to do, I wasn’t confident in all my techniques and I wasn’t sharply focussed on patterns. Despite all that, I managed the fundamental movements and patterns without too much problem (although there were a couple of technical concerns in ToiGye with my slow elbow thrusts and my wedging blocks) but I had a bit of trouble with my board breaks. I managed to break first time with 3 of 5 techniques but had trouble with the other two techniques despite doing them successfully on quite a few occasions during training. I was extremely disappointed with that aspect of my grading, but overall I guess I was content so long as my next grading performance is much sharper. Somehow I don’t seem to have Yul-Gok completely in my head although I like the pattern a lot. The circular block just isn’t flowing properly although funnily enough I feel like I can now do Won-Hyo better just by learning Yul-Gok – I’m not quite sure how that works. I spent ages and ages practising board breaks and made sure that I asked people to hold boards for me at training (and other people also practised with my boards since I had them out). My goal for this grading was to get my board breaks first go including the combination kick (front kick – side kick same foot). I was really pleased at the grading that I actually did get all my breaks first go, and I was actually not too unhappy with the rest of my stuff too. My patterns were not fantastic, but my sparring has improved and so has my one-step (even if Sabum Cariotis is not happy with it … ) I was also really happy that Krista came to watch me and Tim grade – at least she now knows what we do given that it takes quite a bit of time. My grading for blue belt required not only a new pattern and two board breaks, but also an adjustment to the fact that I was sort of grading alone because Leila had to miss training because of Ramadan and missed out on the grading. I did one-step sparring with Movan (sp) but we didn’t really train much together and although we encouraged each other on the day, it wasn’t the same as grading with Leila and Leanne. My board breaks were side-kick and downward knifehand strike. The knifehand was pretty easy for me but it took 3 tries to get the sidekick despite lots of practice. I kept stopping at the board rather than going through it, although when I did break it, it felt easy. Although I’m happy to have my blue belt, I didn’t really think that I nailed the grading in the way I’d like to, with my patterns still pretty stiff and un-flowing, my sparring somewhat unimaginative, my one-step sparring a bit diabolical and board-breaking not clean enough. Grand Master Leong is a very impressive person, softly spoken, gentle in what he says, but demonstrating amazing technique and crispness giving an aura of power which was somehow accompanied by an exquisite softness of movement. update many years later: I trained with GM Leong a few more times and he never showed anything other than sine wave in Chon-ji. While I’m sure that I more to learn about sinewave and Chon-ji, I now also know that what we were shown by GM Leong had numerous harmonics that would not enhance power in any way.